Daredevil is clearly the best of the Marvel Netflix TV endeavors. Cutting an almost perfect line between action, style and substance.. This show probably set the bar too high for the follow-ups like Luke Cage and Iron Fist. While Jessica Jones was pretty great, Daredevil was awesome, save for the season finale in season 1. What was that? Now that sophomore season is over and the somewhat lackluster The Defenders behind us, it’s time to think about Daredevil Season 3. (so much happened in Defender how did it feel to flat?) Filming starts early next year and the big news is apparently King Pin aka Wilson Fisk is back stomping concrete. Concept artist James Holland (via ComicBook.com) has shared two looks of the return of the villain in a double breasted suit. Pure white, a color not often associated with bad seems to be the direction his tailor is suggesting. You know why Deadpool wears red right? So the bad guys can’t see him bleed. Why would he wear white, to blend with the righteous maybe? Notice the purple in concept two, curious to see how much purple Fisk will wear this new season (see also Kilgrave’s complete wardrobe from Jessica Jones). 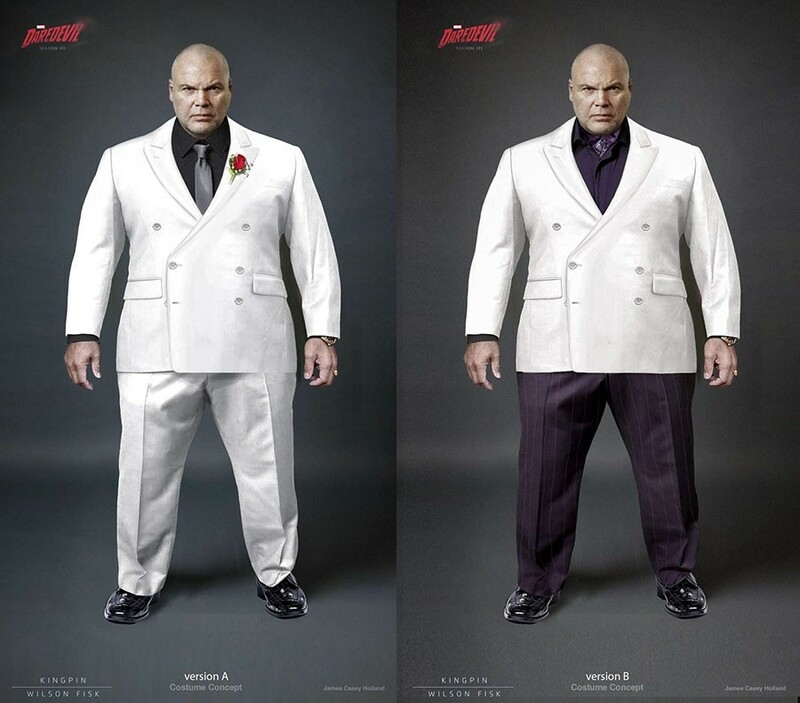 Good to see Kingpin won’t be getting a What Not To Wear makeover, just a tweak for his return. Speaking with We Got This Covered, actor Vincent D’Onofrio (I just saw him in the CHIPs movie) says Daredevil season 3 will “blow fans away.” Well no one has ever promised that before, but I have high hopes. According to Vincent the story will be more emotional this time around. D’Onofrio joins the other perfectly cast members in the Daredevil storyline “Born Again.” At least that is what I’ve been reading on THR. It will acknowledge the events from the end of The Defenders and go from there, but it will not follow the comic series page for page. Hopefully we will also learn Elektra’s fate. I feel bad for her.